I mentioned a few posts ago that this was going to happen, and it did. I gave a speech. Brad and Oliver from Verrico Associates invited me to contribute to an Earth Day Eve celebration that they and Sovana Bistro, one of their clients, put together. They asked me to talk for five minutes to about 150 people about what I'm doing personally and professionally to save the world. It was a pretty serious assignment, but I told them I'd do my best. 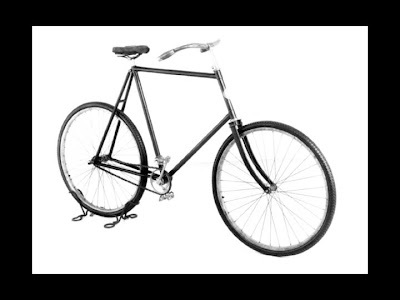 They gave me (and the other four presenters) two slide maximums, so I decided to get a little weird and have my first slide be a picture of a bike. I said the presentation wasn't about bikes. I said I was showing a picture of a bike because a bike was my primary means of transportation when I lived in Beijing. Generally speaking, however, I'm too big for Chinese bikes, and the ones I rode were constantly breaking. I had a big need, all the time, for bike mechanics. Luckily, there are heaps of bike mechanics in Beijing. Heaps. I employed the services of many of them, and, with varying degrees of success, they fixed the things I had broken. As the months and years went by, I developed loyalties. There were a handful of mechanics to whom I'd bring most of my business. I liked them. They treated me well. They treated me fairly. And they had compelling stories. They would tell me where they were from, why they were in Beijing, what their plans were for their bike mechanic businesses. And I kept going back to them and felt good about it every time. It was enjoyable for me to SUPPORT their businesses. And that's what we do every time we buy anything. We SUPPORT the business that makes that product or offers that service. And, here in the developed world, here in the States, almost all markets for all products and services have an important similarity to the bike mechanic market in China. Buyers have lots and lots of CHOICE. What can we do with that choice? I think we can start by asking ourselves two questions: What do I want from the businesses I support? Which businesses are doing the things I want businesses to be doing? For me, in Beijing, I wanted my bike mechanic to fix bikes well, treat me well, and be willing to share his or her backstory with me. Now, back in the US, if I'm buying running shoes or toothpaste or a mobile phone, I want to support businesses that are radically socially and environmentally responsible. I want zero greenhouse gas emissions. I want no toxic materials dumped anywhere. I want products build of either biodegradable materials or materials that are infinitely recyclable and conveniently recycled. I want all employees, part time laborers included, to be treated with respect, have dignity in their work, and earn a fair wage. I want huge philanthropic generosity. And I want radical transparency. I'm not going to get all those things, of course, but I want to support companies that show me that they're moving in that direction and committed to getting there. Which companies are on that path? I know what I want. Now I want to know which businesses I should support. And here's the problem: I don't know. I don't know which businesses are doing what good things for the world. I don't know which businesses are moving toward the radical responsibility I want. Information about companies and their processes practices is hard to find. It's not organized. It's inconsistent. It's quite likely disputed. We have a hard time finding it and often don't know what to make of it. We have an education problem. An enlightenment problem. We need a market similar to the Beijing bike mechanic market. Similar not only in its abundance of choice but also in its transparency. How do we get there? How do we educate? How do we enlighten? Bringing what we do know into schools and classrooms. Writing books and papers about intensely focused research. Talking to friends, and working as small communities to figure things out. Giving five minute Earth Day Eve speeches. Using the internet, it's connectivity and speed and flexibility. I'm taking the internet route. I'm far from the only or most impressive show in town at this point, but I have started a bit of a conversation on the blog, and I'm working with some programmers and building a brand comparison website. I showed my second slide, a black background with white letters saying www.moreperfectmarket.com, told people to come talk to me later if they wanted details about the startup project, took a couple of questions, and wandered back into the crowd to rest my brain and watch the other speakers speak. And they were great. The people that came to talk to me after were a lot of fun. And Sovana Bistro was a wonderful host. The speech is a work in progress. I hugely appreciate Verrico and Sovana giving me an opportunity to try it out, and hopefully I'll get a chance to give it again soon (or give a revised or expanded or simplified version of it soon). If anyone has any thoughts after reading the recap and seeing my two gorgeous slides, I would love to hear what you have to say. 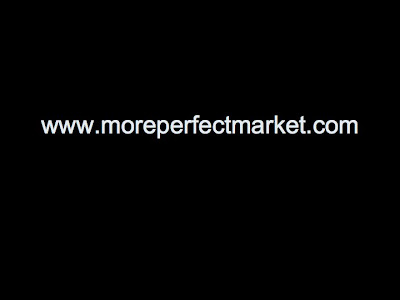 Comment or email (moreperfectmarket at gmail dot com) or Facebook or LinkedIn or however you like to communicate. Note: Those of you that met me at the event last night and are now looking at the blog for the first time, I'm sorry to do this to you. I ask you to come visit, and the first thing I give you is a story you've just heard. I'm apparently not the most gracious online host. I wanted to go back through my presentation notes today, and I thought the friends and colleagues that weren't at the restaurant last night might want an update. I figured I could accomplish both goals by writing out loud. You were the victims of my need to review and gather feedback. I'll try to get you something new soon. Hello - I'm a friend of Giuls, and she directed me to your site. I've often (along with everyone else, I suppose) asked myself a lot of the same questions you post. Good luck with the project!